Today, at the Central House of Artists (room number 14) opens an exhibition of Victor Victor Ефимовича Tsigalya (1916-2005) and Mirel Shahinian. Presents paintings, drawings, sculpture. Painter Victor Efimovich Tsigal born May 21, 1916 in Odessa. Since 1930, he lived and worked in Moscow and Koktebel. In 1938, he graduated from art school memory 1905. Student-diplomnikom the Moscow Art Institute went to the front. During the war, he created the album of drawings «Heroes fighting. Tenth Guards Tank Ural-Lvov Volunteer Corps »(Sverdlovsk: Ural worker, 1945). In 1946 graduated from Moscow State Art Institute. The artist worked in a lot of publishing «Children's Literature», art, and illustrated the classic children's books. At the same time, painting, graphics, decorative art, sculpture in metal, ceramics and glass. 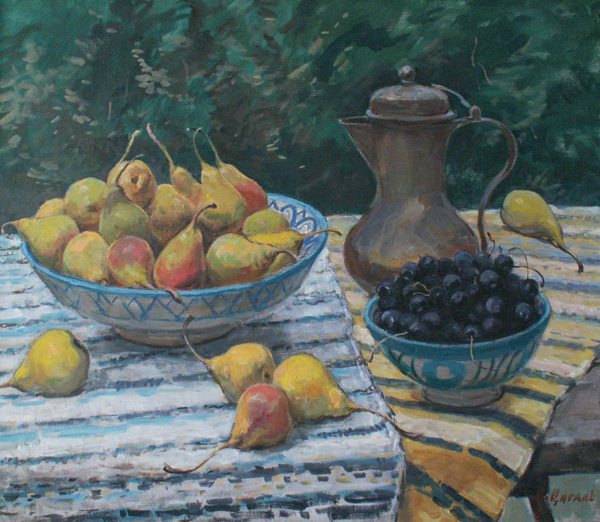 Many of the paintings of Victor Tsigalya dealt uniquely beautiful nature of East Crimea, where the artist settled in Koktebel for many years in his house-studio. However, work in Koktebel does not restrict the interest to the artist's life throughout the country. He made the long trip to Dagestan, Azerbaijan, on the Kuban and the Altai. After each mission born of creative graphic and pictorial cycle of work, described in the plastic and the color of the land and its people. At the root of all the works of Victor Tsigalya is the picture - the composition of building confidence, the identifying character of a human face, it's easy locking movement, the details of the situation or scene. Another quality Tsigalya-painter - complete freedom and skill in the image of animals. Many of his works «live» the horses, dogs, buffaloes, sheep, cow, donkey. Victor Tsigal - People's Artist of Russia, laureate of State Prize. Repin, a full member of Russian Academy of Arts. His works are in the Tretyakov Gallery, State Russian Museum and other Russian and foreign collections. The exhibition, running from 25 February to 8 March in the Central House of Artists, the attention of the audience will be presented to several art and graphic cycles Wizard: «Koktebel», «Arbat», «Parnu» and others, as well as sculptures in metal . The works provided by private collectors and the artist's family.